When we bought our house eight and a half years ago, the thing I loved the most about it was the front window. The house was unfinished and as we walked around on the sub-floors, I tried to picture furniture we didn’t even have yet in each room. I tried to imagine how I would fill all the rooms with lovely things that made it feel like a home. I couldn’t comprehend that this space would ever feel small or cramped. We were just two, soon-to-be-married, twenty-something kids and this was so much space for just two. Never did I understand how baby things and toddler toys and little boy treasures would fill it up to bursting. Some days all I can see are the crowded cupboards and overflowing bins. I focus only on what takes up space. But other days, when the light shines in and a cool breeze blows easily through the house and the smell of fresh cut grass wafts up into the house, I am suddenly stopped in my tracks at all this house has done for us in the past eight and a half years. And I still love the front window the best. That is one stunning window. I love them big too. Gorgeous. I love that big window! A definite must in our next house! I like how Bird keeps a watchful eye on how well I mow the lawn. I LOVE the smell of freshly cut grass. It is one of those flashback inducers like honeysuckle and makes me stop and just breathe. Awww he is such a cutie and I love this picture. While I would love the window I am not sure I would be a fan of cleaning it lol.. I love your front window, too. It is gorgeous. Aaah. Nice window. It’s hard to move on to the new thing when you have so many memories, but there’s also this sense of thrill and adventure. Oh my goodness. What I would not give for a big front window to let in all the light. So beautiful. Such a lovely ode to home. Oh, what I’d do for bigger windows, but we live in a walk-up apartment with just regular size ones! 🙂 That photo is gorgeous!!! I love that window. 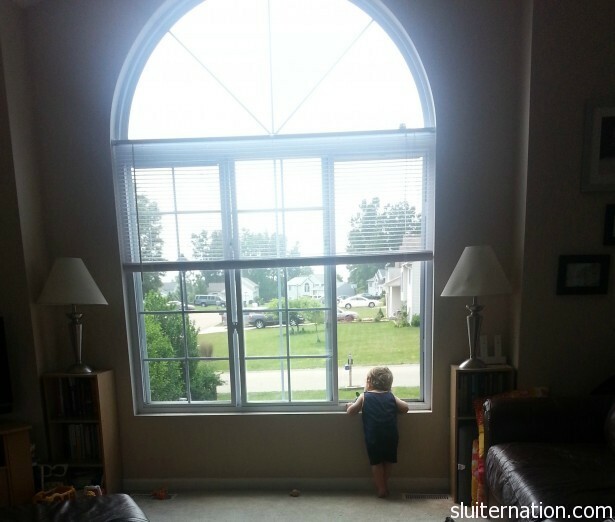 There is a window I love in our home, something about it just makes the house complete.